the Angels free agent tandem, what the Rangers could do (sign Kinsler long-term, Darvish) and what about Kendrys Morales and Mark Trumbo. Baseball Daily Digest Radio with Joel Henard and Albert Lang at http://www.blogtalkradio.com/thefantasyinsiders/2011/12/13/baseball-daily-digest-radio-with-joel-henard-and-albert-lang to air at 7:00 PM ET. Sometimes when I read the backs of these cards, I am like, WTF, what the what, the ladylike, just like me? Yeah I don’t get my brain sometimes either. I’m not even real sure where to start with this. 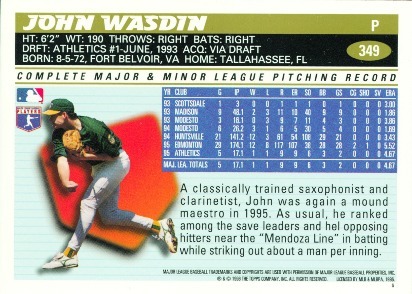 I’ll go ahead and get the obvious typo out of the way – I don’t think Wasdin “hel opposing hitters…” I’m guessing he held them, held them tight with his clarineting and saxaphoning. But, let’s dig into the massive factual inaccuracies on the back of the card. I really believe the narrative on the back was written about someone else and they simply assigned it to Wasdin. I can find no evidence that Wasdin was a classically trained saxophonist or clarinetist. 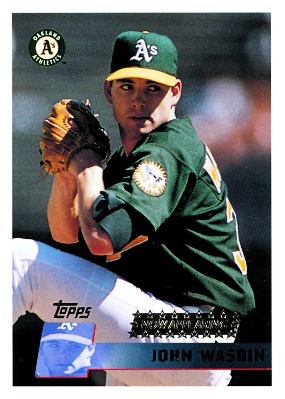 In addition, it’s hard for Wasdin to be a mound Maestro in 1995 given he appeared in just 5 games (and 17.1 IPs) for the Athletics. He didn’t even pitch particularly well: 4.67 ERA and 6.10 FIP. Moreover, he didn’t record a single save in the majors until 1999 and only recorded seven in his major league career and just four in the minors. He might have ranked among the save leaders of those pitchers who appeared on June 11, 1999 – but that’s it. The actual vignette had to be written about one of a select group: Randy Myers, Tom Henke, Heathcliff Slocumb, Todd Worrell, Roberto Hernandez or John Wettland – as they finished in the top 10 in saves and all had K rates near nine. I couldn’t find any references to Myers, Henke, Slocumb, Worrell or Hernandez. Then, I hit pay dirt (I mean you had to assume it was Wettland, given his first and last name, right?). Googling John Wettland’s 1996 Topps card leads to this link: http://mikekenny.blogspot.com/2010/07/classic-card-of-week_08.html. So we’ve got a culprit. Poor John Wasdin, not even good enough to have the anecdote on his rookie card right. And it’s not as if John Wasdin was some career journeyman…yet. He was the 25th overall pick in 1993 and progressed nicely in the minors: before the 1995 season, he was the #53 prospect. The following year he was the #84 prospect. Unfortunately he could never pitch like Wettland and crisscrossed the country during a 12-year career. In 1997, Wasdin (and cash!) was traded to the Boston Red Sox for Jose Canseco. He played four years for the Red Sox, earned $1.5 million and was worth 1.7 WAR. He was bitten by the Green Monster a lot: 1.4 HR/9, leading to the nickname “Way Back Wasdin” a riff off Jerry Trupiano’s signature homerun call. Having lived out his welcome in Boston (after two miserable post-season performances against the Indians in 1998 and 1999), Wasdin (along with Jeff Taglienti, Jeff Frye and Bran Rose) was shipped to the Colorado Rockies for Rolando Arrojo, Rich Croushore, Mike Lansing and cash. He stumbled around from there, pitched a perfect game for the Nashville Sounds that only 750 people saw, and ended up in Japan. 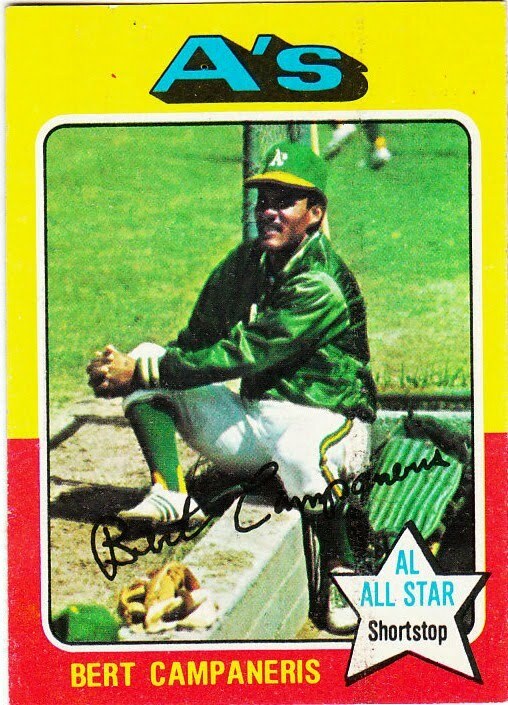 It’s odd to think that the most memorable aspect* of Wasdin’s career is the erroneous back of a baseball card. I certainly never would have investigated his career had I not been initially stunned by the verbiage. *As Bill Parker, who writes awesomely and uncommonly for the Platoon Advantage, points out: John Wasdin’s change-up in one of the late 90s version of Triple Play was randomly clocked at 120 MPHs. If I knew this, I forgot, if I didnt, I’m ashamed. Maybe I play in too many OBP leagues and it colors my mind into shades of green and yellow, but I seem to be one of the few people who like Daric Barton (who owns a career .369 OBP) in standard 5×5 leagues. While power gets the girls and glory, there seems to be a crop of first basemen who are helping in the other categories while eschewing power. Most notably, Billy Butler fits this mold, but so do Gaby Sanchez and, to a lesser extent, James Loney. While he barely touched double digit HRs last season, Barton did score 79 runs and knocked-in 57 for a miserably unproductive A’s offense. In addition, he posted a decent .273 AVG and a sublime .393 OBP. Given his patience at the plate, he’ll continue to log at bats near the top of the line-up and should score his fair share of runs – at least 85. Meanwhile he has the upside to hit 15 HRs and knock in 70+ – while unspectacular, it’ll play in some deeper leagues. Certainly if someone like James Loney is being selected about 100 spots ahead (he’s the 226th player), people should kick the tires on Barton. I imagine their power numbers will be identical – Loney will likely best him in average slightly and put up a smidge more RBIs – but Barton should outpace him by a decent margin in runs. Basically, if you think James Loney can you help you, just wait 100 picks or so and grab Barton. For what it’s worth, Barton is a full 16 months younger than Loney. This recommendation is more for AL-only leagues, those with OBP, or leagues that require corner infielders. While I think Barton is about correctly priced, there is simply no reason for a 100+ pick gulf between him and Loney. While no two drafts are identical, knowing where a player typically goes gives you a general idea of where he will go in your draft. That said, be sure to do homework on your league mates subjective tendencies. For example, if there are Red Sox fans, be sure to snag guys like Lester and Youkilis a bit earlier than you normally would. In addition, you should talk up your sleepers before the draft (discreetly of course) to see if anyone is on to them. If you don’t, an opponent with an itchy trigger finger who hasn’t done his ADP homework might snag one of your sleepers a round before anyone else is typically taking him. With news that Joey Devine, he of the 0.59 ERA last year, is headed to the DL and Dr. James Andrews, Brad Ziegler appears to be the next closer wire claim of the unborn season. In 59 innings last season, Ziegler struck out 30 batters (not great), but posted a 1.06 ERA and 1.15 WHIP. With worse ratios than that, he could be a 30 save closer in 2009. He is certainly someone who can step right in for Joey Devine and perform. Don’t forget, last year Ziegler set a major league record for most consecutive scoreless innings to start a career. There is the chance that major league batters caught up to his funky delivery slightly, as he posted a 3.00 ERA in September/October. Still, as a waiver wire pick-up, you should be jettisoning your Mariner’s closers, Fernando Rodney, Chris Ray, George Sherrill, Chris Perez, and J.J. Putz types. A 3.00 ERA closer is still a rosterable entity.